This post has 66 views. 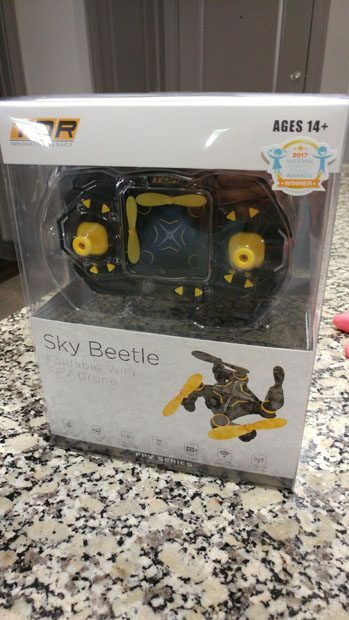 The Sky Beetle arrived in a clear plastic packaging that showed off the controller and the drone itself. 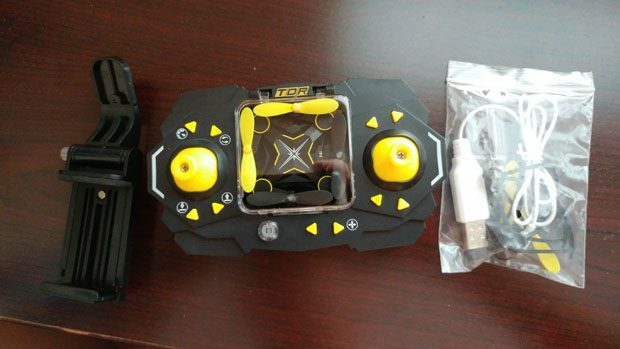 The box is mostly white, but the Sky Beetle drone and controller have a black and yellow color scheme. Unpacking the box revealed the instruction pamphlet, the controller with the drone inside, a phone holder that inserts into the controller, and a bag of goodies. The goodies bag contains a USB charging cable for the drone, 4 blade guards and 4 replacement blades for the drone. Everything that came out of the box. As you can see from the pictures already, the Sky Beetle drone itself is tiny. When folded, the drone is roughly a 2-inch square and fits inside a chamber in the center of the controller. Even when unfolded, the Sky Beetle will fit in the palm of your hand. 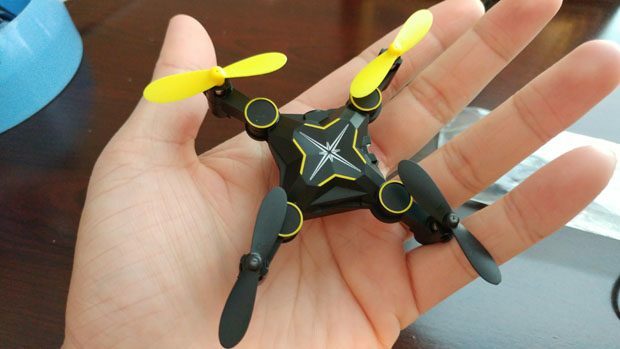 It has the typical quadcopter design with four propellers. The Sky Beetle has a small VGA camera on the front, and the charging port and on/off switch on the right side. It takes about 20 min to fully charge the drone with the USB cable, and that provides about 5 minutes of flight time. Compared to the drone, the controller is of course a lot bigger. The controller takes 4 AAA batteries which are not included. In the center is the chamber that holds the drone, and this chamber also contains a charging cable so the drone can charge from the controller batteries. There are two directional stick, one that controls the altitude and which way the drone is facing; the other stick makes the drone move forward/backward/left/right. There is the on/off switch, buttons for take off and landing, adjusting the trim, doing tricks, and enabling headless mode. Getting the Sky Beetle into the air is pretty easy. Just turn on the drone, and then turn on the controller. 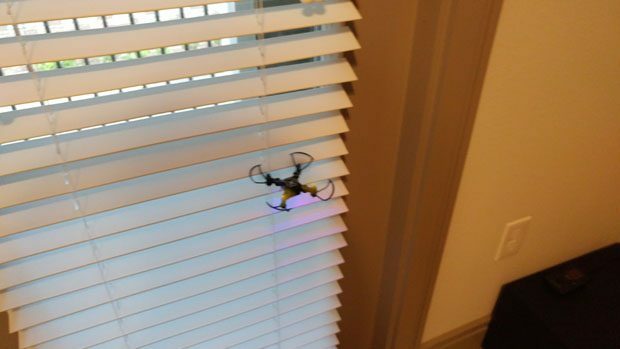 The drone is paired with the controller when its lights stop flashing and hold steady. The propellers are turned on by holding the left stick to the lower left and the right stick to the lower right, and then take off is done with the take-off button. The TDR Sky Beetle in flight. Upon first flight, I notice that the Sky Beetle doesn’t hold steady and tends to drift in different directions. It doesn’t really stay in one place. I am not too familiar with drones, but perhaps the ability to automatically hover in one place isn’t available at this price point, or not with a drone this small. 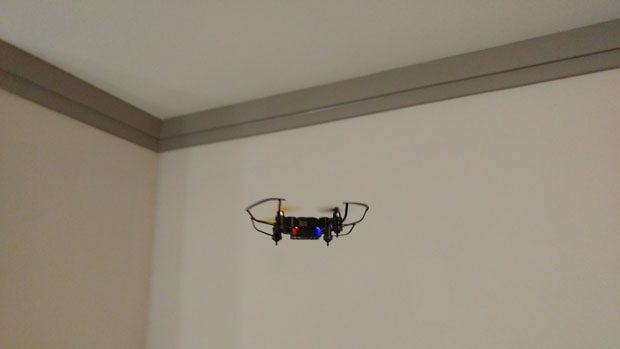 Because of the drifting and the fact it was my first time flying a drone, I crashed the Sky Beetle quite a few times into walls and furniture. I did end up getting the hang of it. The drifting can be adjusted a bit with the trim buttons on the controller, but I could never get it to consistently stay in one spot. About the crash the Sky Beetle into the door blinds there. The TDR Sky Beetle has the first person view (FPV) feature where the user can see the view from the drone’s camera on their smartphone. 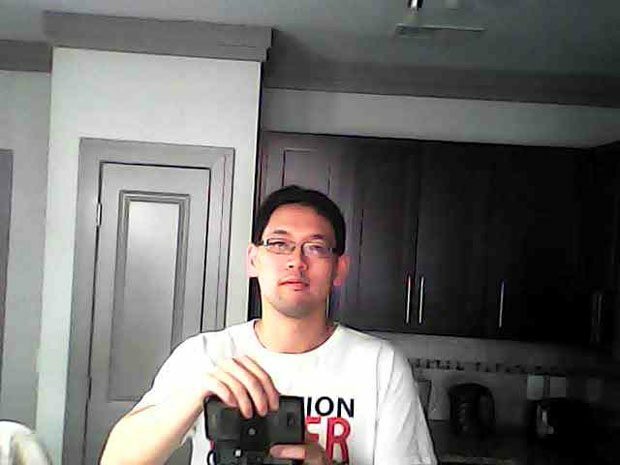 To use FPV, I had to install the TDR Viewer app on my phone, and then connect to the Wi-fi network from the drone (network ID starts with TDR). It was a seamless process and I was able to get the FPV from the Sky Beetle on my phone. You can take videos and pictures with the TDR viewer map, but the quality is not great since the Sky Beetle only has a VGA camera with no stabilization. Also the video has no sound since there is no microphone. It’s nice to have the picture and video features, but you’d have to buy a camera drone to get the nice panning video shots you see on Youtube videos. Photo from the Sky Beetle of my mug. Don’t remember the last time I saw a VGA-quality photo. The Sky Beetle has some built-in tricks. You can do a tornado spin, an orbit flight, and a left or right 360 degree flip. The tornado and orbit are use the same button on the controller, while the flip is done by pushing down on the right stick and then moving that stick left or right. My overall first impressions of the TDR Sky Beetle is that it’s a neat toy. You can fly it and do some tricks to provide amusement, and the small package means it’s easy to transport. The small size does mean that the flight time is short per charge, and it’s not really designed to take videos or photos. I like the Sky Beetle, partly because I got it for free . I can practice my drone-flying skills with the Sky Beetle before I get a more expensive camera drone.